The legend of Champ, or, at least, the legend that became the legend of Champ, actually pre-dates the first sighting by centuries. Both the Iriquois and Abenaki tribes, who lived beside the dark, glacier-wrought lake before it bore the name of French explorer Samuel De Champlain, traditionally submitted offerings to an entity that they claimed was hidden beneath the lake’s still, black waters. Still, most of the polytheistic native cultures had water spirits or other aquatic deities that they ritually attempted to placate and satisfy in order to ensure full harvests and good health. The Iriquois, who supplicated a being in Lake Champlain (then called Lake Ondakina), also made offerings to the nearby Niagara falls, annually pitching a white canoe, filled with fruits, vegetables and a virgin, over the roaring cataract and onto the foam-addled rockbed below. 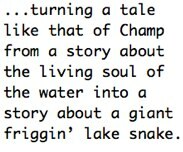 Researching America’s many lake monsters reveals that almost every one can be traced back to a Native American legend that, more often than not, was boorishly literalized through the polarizing lens of European culture, turning a tale like that of Champ from a story about the living soul of the water into a story about a giant friggin’ lake snake. These sightings all underscore a larger point about the changing landscape of America and the development of technology that, in cases like that of the tourist steamboat, allows, and in cases like that of the railroad workers, forces, people to come in contact with formerly unfamiliar natural environments. The third sighting demonstrates this strange dichotomy – as new and exciting technological developments enter the cultural vernacular, so, to, do previously rarified elements of the natural world. In the eyes of a child, the natural thing that astounds him – a sea monster – is described in terms of a corresponding technological development that astounds him – a steamboat. A lot of these folks had only recently been given the opportunity to chuff out into the black center of the lake, borne out by exhalations of pressurized steam, or stare out, between hammer strikes, across a sprawling, adjacent plane of bruise-colored water. A common animal of uncommon size would be monstrous, fantastical and unfamiliar to an observer unaccustomed to the thriving, multifaceted eco-system of the lake. Not to mention, once one person believes that they’ve seen something extraordinary, others follow suit. With the railroads quickly turning America into a manic stitch-work of spikes and ties, it only made sense for P.T. Barnum to purchase a train and make the most of his profession. “P.T. Barnum’s Traveling World’s Fair, Great Roman Hippodrome and Greatest Show on Earth” was already proving hugely successful for Barnum when he got wind of the increasing number of lake monster sightings coming out of the New York and Vermont areas. Always as much a debunker as a showman, Barnum immediately offered $5,000 for the carcass of Champ, stating that if such a creature existed, he had to have it as part of his fantastical cabinet of allegedly natural curiosities. 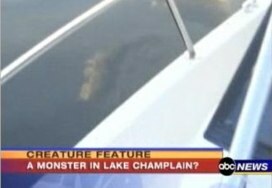 If the fevered testimony of a dozen amazed eye witnesses wasn’t enough to convince the American Northeast that a reptilian goliath was swimming figure-eights beneath the growing number of railroad trestles, ferries and lighthouse beams that criss-crossed and skirted each other across the surface of Lake Champlain, the winking endorsement of the Prince of Humbugs certainly was. The local obsession that, over the past century, has, ultimately, done more good for the binocular industry than any facet of modern biology, was born. 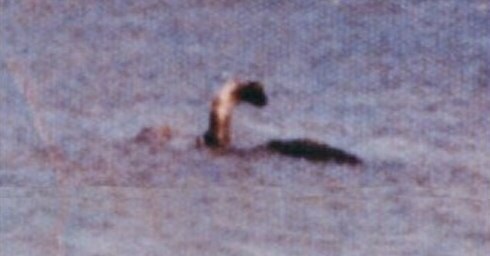 In the 20th century, after many obsolete steamboats were scrapped and rail lines were torn up or abandoned to make room for highways, other technological advancements, especially the development and production of consumer-grade photography equipment and video cameras, ensured an enduring audience for America’s most notorious sea monster. Champ has been embroiled in photograph doctoring scandals, subjected to state-of-the-art echolocation techniques and even forced to brave the emoticon banner ads and inane talkbacks of YouTube, starring in a highly disputed, recently-removed video in which he darted beneath a fisherman’s boat. As the legend perpetuated, giving way to the aforementioned statuary, logos and mascotdom, Champ has taken on a kind of mythic status, larger and more indelible than the enigmatic sum of 300 reported sightings. More than just an urban legend or cautionary rejoinder delivered in the name of safe swimming, Champ represents the life-effusing quintessence of a region; he is bound to the lake, but master of its waters, and possessed of eyes that have witnessed the triumphs and tragedies of Champlain’s beaches, inlets and people – people who, in turn, claim to have, in fleeting seconds lost quickly to the white glare of the afternoon sun or the eldritch darkness of evening water, witnessed him. In this way, Champ has once again become the stuff of Iriquois legend, bestowing fortune upon towns who offer up small tokens, like car wash signs and minor league baseball, in tribute to his enduring existence.